This is a reproduction of a book published before 1923. This book may have occasional imperfections such as missing or blurred pages, poor pictures, errant marks, etc. that were either part of the original artifact, or were introduced by the scanning process. We believe this work is culturally important, and despite the imperfections, have elected to bring it back into print as part of our continuing commitment to the preservation of printed works worldwide. We appreciate your understanding of the imperfections in the preservation process, and hope you enjoy this valuable book. ++++ The below data was compiled from various identification fields in the bibliographic record of this title. 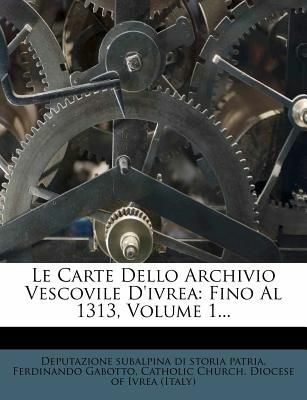 This data is provided as an additional tool in helping to ensure edition identification: ++++ Le Carte Dello Archivio Vescovile D'Ivrea: Fino Al 1313, Volume 1; Volume 5; Volumes 5-6 Of Biblioteca Della Societa Storica Subalpina; Documenti E Studi Sulla Storia D'Ivrea; Le Carte Dello Archivio Vescovile D'Ivrea: Fino Al 1313; Ferdinando Gabotto; Volume 5 Of Deputazione Subalpina Di Storia Patria; Deputazione Subalpina Di Storia Patria Deputazione subalpina di storia patria, Ferdinando Gabotto, Catholic Church. Diocese of Ivrea (Italy) Tip. Chiantore-Mascarelli, 1900 Travel; Europe; Italy; Italy, Northern; Ivrea (Italy); Travel / Europe / Italy.